Our first DVD ever released. Edited completely by Martin Sweet. This is the second pressing, which means that we've sold more than 1.000 of them... still widely popular and a collector's item for sure :). This DVD is region free but in PAL format, not NTSC. It plays fine on any computer but if you are in a NTSC-country (USA, Canada, Chile, Mexico amongst others) it might not be playable on your dvd-player hooked to your TV, unless it specifically supports playback of PAL dvd's. If you are unsure, please check your dvd player manual before you place your order to make sure you can actually watch the DVD :). I''m speechless, this DVD is so damn cool! Even better than I saw it in my diethead dreams. Handsome rebels from Sweden, young and tough in their 2005! One of the best Lives ever: one-line, true and full of energy. It’s a miracle to see Dave alive. Must have for each and every true diethead DVD-collection. This dvd is A GREAT DVD! IT IS A MUST HAVE FOR A CRASHDIET FAN! REALLY WORTH EVERY PENNY! 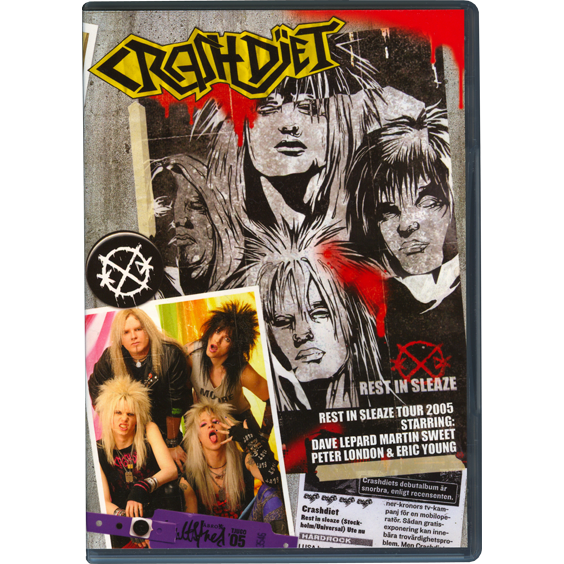 fantastic product,both for old and new fans of crashdiet,this dvd showcases a man who in my eyes would've been one of the greatest front men of all time at his best doing what he loved 'spreading the word or what rock 'n' roll' it's quite simply awesome,jam packed full of features and amazing live shows showing dave and the rest of the guys bringing rock back to anyone who will listen,,,if you don't own it then you must buy it!!!!!!! See all 41 customer reviews. concerts with late front man Dave Lepard.